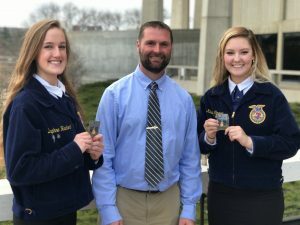 Two Lynnville-Sully senior FFA members – McKinley Conover, daughter of Ben and Tara Conover of Lynnville, and Daphne Hackert, daughter of Steve and Diane Hackert of Sully – were awarded the Iowa FFA Degree at the annual Iowa FFA Leadership Conference on Tuesday, Apr. 24, in Ames. The Iowa FFA Degree is the highest degree the state can bestow upon a member, and those receiving the degree are selected for nomination by the State Committee according to provisions in the Iowa FFA Constitution. Daphne Hackert, on the left, and McKinley Conover flank Mr. Brian Lowry, Lynnville-Sully agriculture teacher and FFA advisor, after receiving their Iowa FFA Degrees on Apr. 24.